Is it just me or is there a bit of a renaissance on lagers? It feels like this once solely ball park staple has been slowly edging out shelf space formerly occupied by other perhaps more challenging craft brews. I like to think that broadly there is a move towards (backwards to?) perfecting the simple styles and letting the essential ingredients speak for themselves. 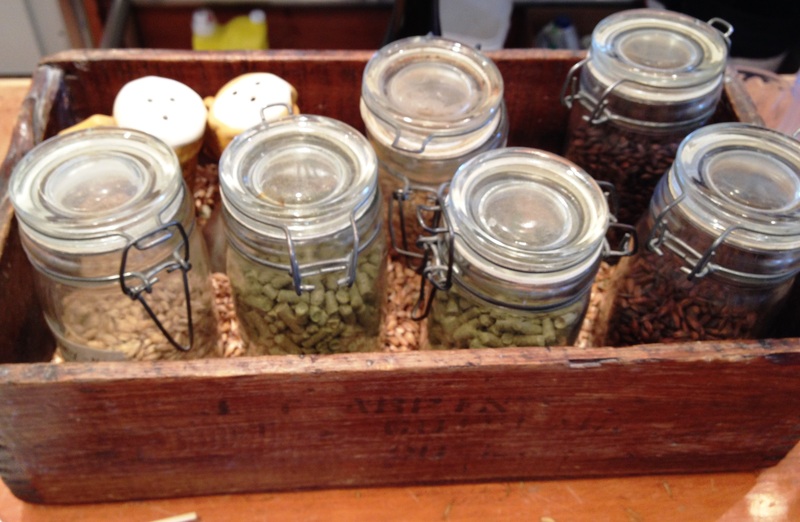 Do we really know how good the underlying ale or lager is once it has been subjected to all manner of spices, fruits, teas, wood chips etc. etc. etc. 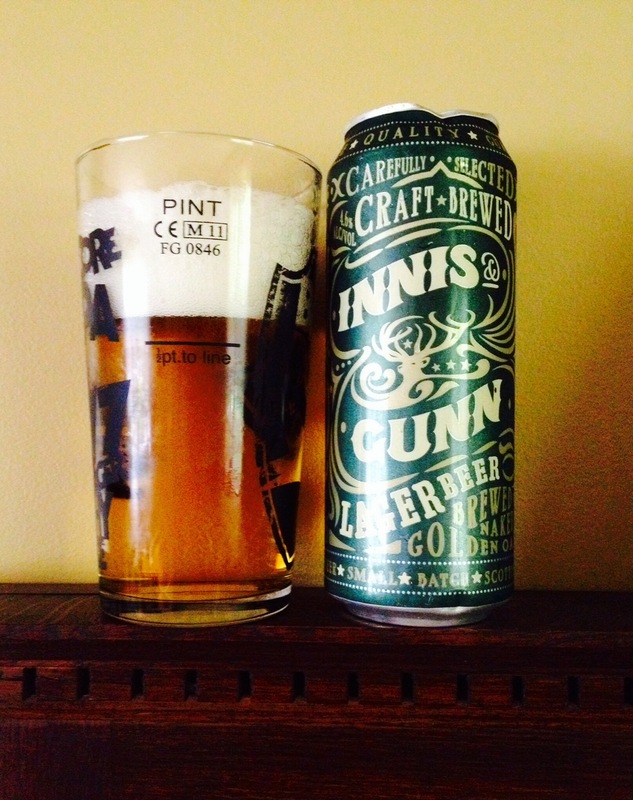 On this note I recently picked up a can of Innis & Gunn lager. To be honest I primarily bought this beer for the arty can but also to sate my desire for clean and simple summer beer that will take the edge off the Ontario humidity. Innis & Gunn lager pours a dark gold colour, very clear with lots of big white head. It is the kind of photogenic brew beer commercials dream of, if you could show beer in beer commercials. The nose is all lager that hallmark yeasty skunky kind of smell that brings you all the way back to your first few under-age sips from a relative’s can. Clean to drink with just a hint of maltiness, a whiff of hop and yeasty character. The finish is easy, non-threatening. There is a reason lagers are ubiquitous at events of a sporty nature they are safe and familiar like an old pal. Overall a nice example of the style wrapped in a pretty can. One of the good things about moving to a new province is the chance to stumble across a brewery you have never visited and whose beer you have never tried. 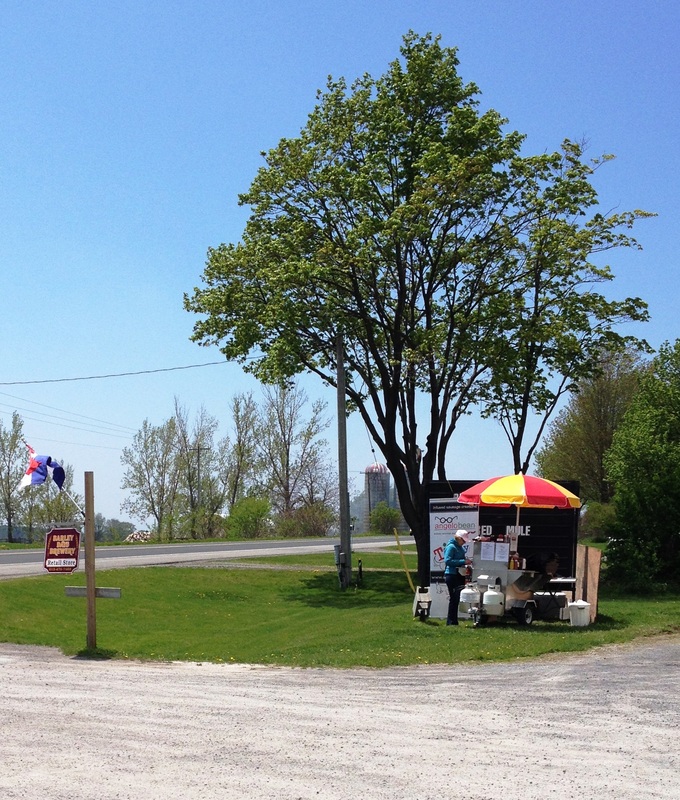 This was happily the case for me and the hubby as we were out touring around Prince Edward County when I saw a sign that said brewery and we had to slam on the brakes – do they make I Brake for Craft Beer bumper stickers yet? If not, I hereby patent the idea! 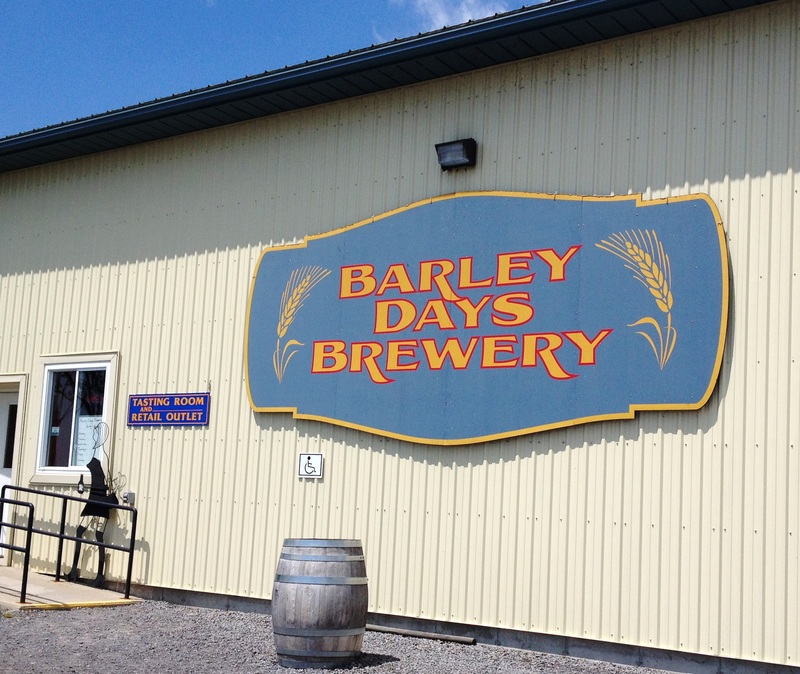 Barley Days Brewery is located, as mentioned, in the very lovely Prince Edward County region of eastern Ontario. An area filled with historic little towns, vineyards, a craft distillery, a cidery and a craft brewery of course. 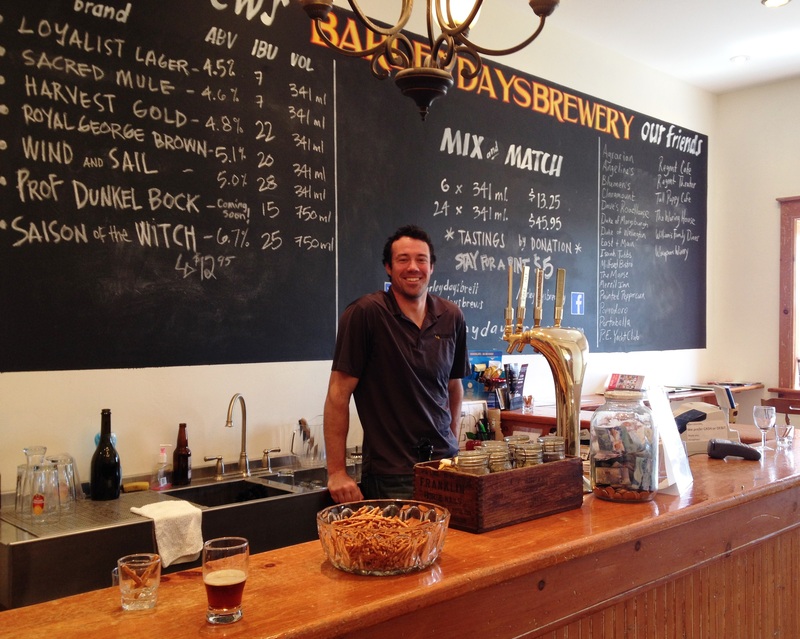 The brewery is your regular set-up, tasting room, some beer swag, pretzels, chalkboards but they also boast a sausage maker hawing his product out front (and tempting patrons inside with free samples). Not sure about anyone else but I am starting to get the impression there is a standard start-up kit for dressing up your craft brewery that includes wooden everything, rustic/industrial themed fixtures and a chalkboard menu. C’mon people let’s think a little outside the proverbial box we certainly do when it comes to our beer so why not when it comes to our breweries? This is not to say there is anything wrong with the ambiance at Barley Days it just feels like I have not seen anything different in quite some time. There were no less than three people behind the bar to ensure I got to try the line-up and to provide the details on the brewery. One particularly nice fellow (an BC’er no less) showed me behind the scenes and even gave me a sneak taste of their new collaboration Rye beer brewed with spices from a Toronto area deli. 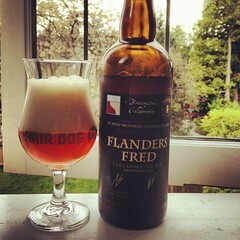 A nice, if slightly young tasting beer, that has lots of potential. I also sampled the rest of the available regular line-up as well and despite my initial reluctant I was persuaded and impressed by their Loyalist Lager (not usually a big lager fan). All their beers were consistent and quite drinkable and I look forward to sampling some of their darker beer offerings after the summer. Another big day in the u-Haul, Juliet we have named her. I saw two wolves, a broken down Firefly (car not insect) and more important intersections during the oh so very long trek across the Prairies. Tonight I find myself in Brandon Manitoba where I had the choice of three craft beers from two different Manitoba breweries. I also learned that Manitoba has beer vendors at some of their hotels, like tiny bottle shops selling beer beside hotel properties. Oh, and you can buy singles out of the six-packs …love that Manitobians! 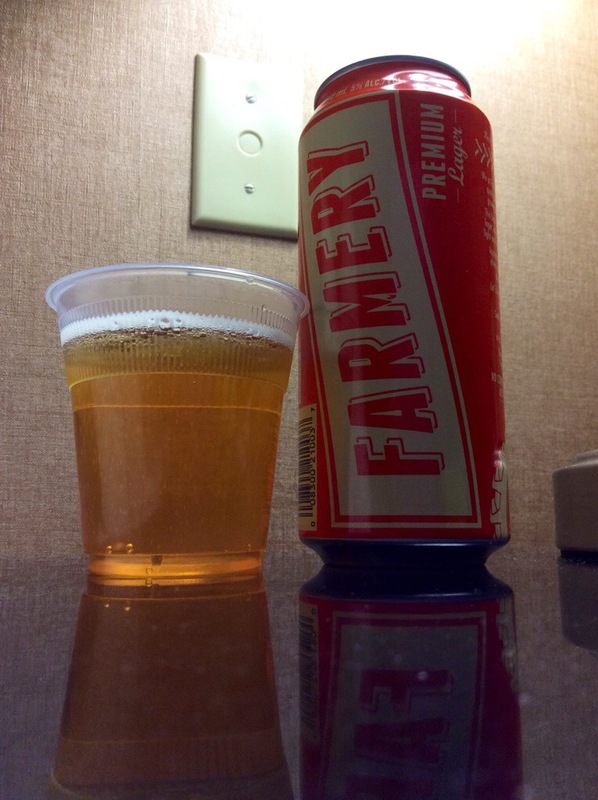 My brew of the evening is a premium lager from Farmery a brewery based in Winnipeg. This lager is described on the can as an all-malt premium style lager brewed with Farmery’s very own barley and hops (big fan of the grow your own revolution). The lager is a deep gold colour. It has good clarity, lots of carbonation and just a minimum of airy white head on the initial pour. First few sips are quite malty, light bodied and very clean drinking. As you drink this lager remains pretty consistent though it really does benefit from being served cold. There is no real lagered yeast aftertaste, which I appreciate as I find it a bit skunky, instead you get a subtle hop bite on the finish. Farmery seems to have added their own unique take on this ubiquitous style resulting in a pretty darn good lager. This review is somewhat overdue thanks in part to my over-enthusiasm for following up my pumpkin beer countdown with a Christmas beer countdown, which left very little time to fit in any barking squirrels. 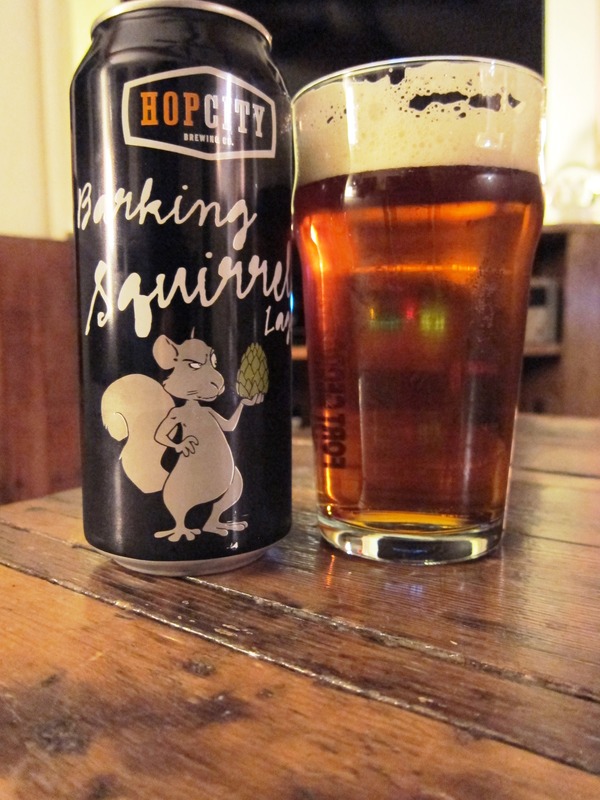 For those who have not yet been introduced to this cutely monikered export from Ontario, let me be the first to put Hop City brewing Co. and their Barking Squirrel Lager on your radar. As a fellow Ontario export I feel a certain obligation to spread the word to the Beer Suspender*, aka the Pacific Northwest, that there are things brewing back east. Rather than bore you with random brewery specs I confiscated from the brewery’s own website I thought I’d be even lazier and plug in their you tube video discussing Hop City. So now that you know a little more about the brewery and the brewers let’s get to their signature beer, Barking Squirrel Lager. BS Lager (poor choice of abbreviation I know) pours a copper orange colour, it is very clear and it has tons of head on the initial pour; the head dies off quite a bit but still leaves a small off-white head and some lacing. There is a very subtle sweetness and a bit of yeastiness on the nose. 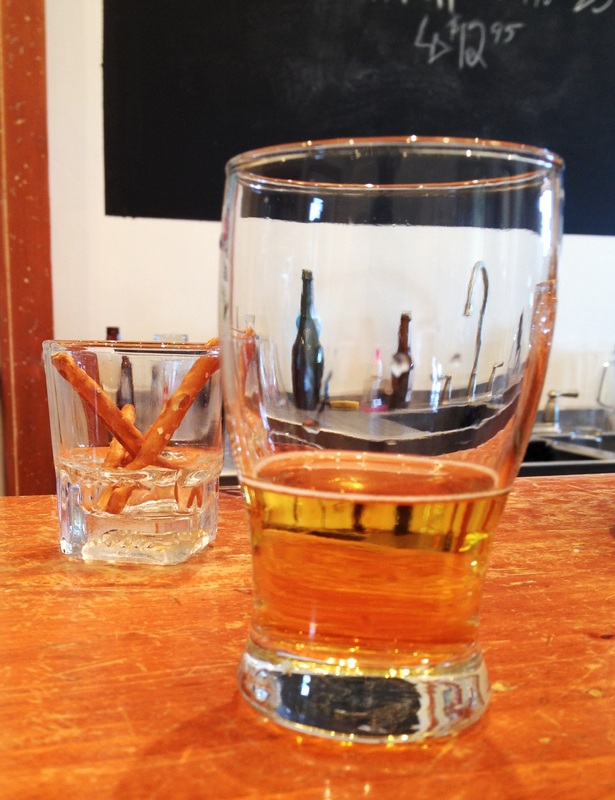 First sip, this lager is very clean and smooth, light bodied and well-balanced. There is caramel sweetness and spicy hop taste but neither element dominates this beer. As you drink the character of the beer remains pretty consistent with the hops coming a bit more to the front. Like the nose the finish is quite subtle with just the tiniest hint of bitterness and also the nuttiness I have come to associate with lagers in general. Overall a very nice session beer though, personally, I am still not a big fan of beer in cans. It is probably psychosomatic but I always think I can taste something tinny as I drink …probably says more about me than the beer. Krampus Imperial Helles Lager from Southern Tier Brewing a behemoth 9% blend of hops, dark malts and lager yeast. Okay first things first, brilliant beer name. The bottle depicts Krampus the Christmas Devil who, according to European tradition, beats the naughty children with chains and sticks – I am guessing there are fewer naughty European children since Krampus seems far far worse than the threat of coal! Krampus pours a clear deep gold with bright white head that reduces to some lacing and a light skim. Big hop nose and first sip is floral and resiny hops at the front of the palate, then dark caramel malts at the back of the throat followed by a deep warming quality. Medium bodied and somewhat viscous this lager sure packs a wallop. The finish is surprisingly not that bitter but instead a little on the sweet side. Krampus is a sipping lager though lager may be a bit of a misnomer for this beer. Overall it is like a Christmas gift to hop heads everywhere; IPA meets Lager meets Winter Warmer, devilish indeed. Krampus is getting eight candy canes out of a possible ten …I hope this does not make him angry. As an avid beer geek (and blogger) I tend to want to try every new beer that comes to market but at the same time I don’t necessarily want to cultivate a drinking problem. As such, now and then, I appreciate a lighter beer that manages to retain its’ craft character without the hefty ABV or flavour overkill. 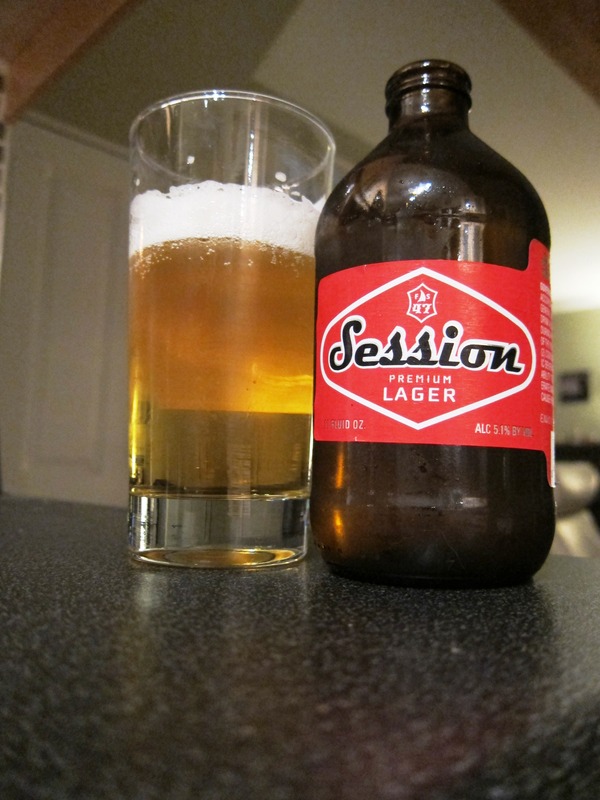 Not too long ago I wrote a post on near beers or small beers but in this post I am not talking about a complete absence of flavour and taste like the dreaded ‘lite’ beers of the 1980’s and 1990’s instead I am referring to a class of beer called session beers. According to Mosher (2009) in Tasting Beer, session beer refers to a class of beer that is lighter in gravity and alcohol and designed to be consumed without overtaxing the drinker in either flavour or intensity. 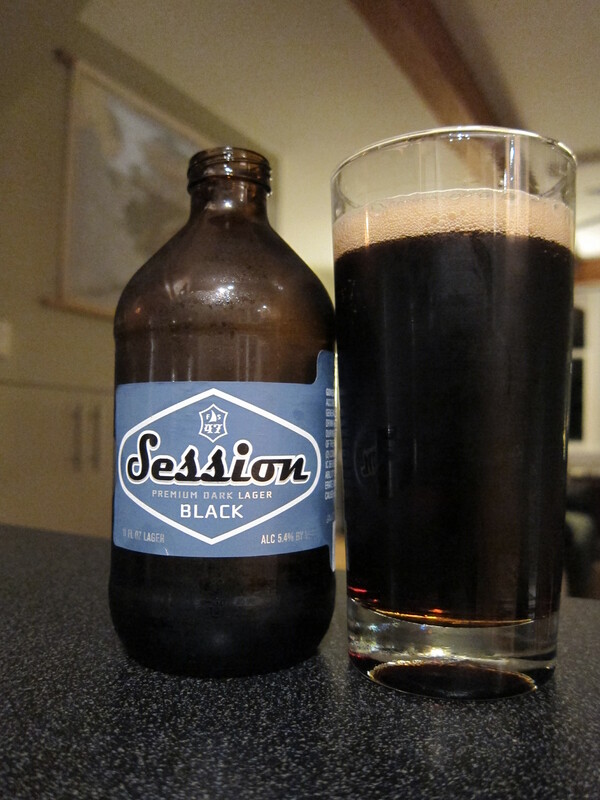 Typically these session beers are less than 4.5% ABV. Mosher cites British Bitter, Witbier and American Adjunct Pilsner as examples of the style. When it comes right down to it what we are talking about is the somewhat intangible quality known as drinkability. Mosher suggests, “There is something quite remarkable about a beer of ordinary strength with enough personality and depth to keep you interested but with enough subtlety to keep you charmed right to the bottom of the third pint”. Our taste buds are not designed to handle a constant bombardment of harsh or strong flavours. Bold flavours are okay in small quantities but we can easily become flavour fatigued by too much of a good thing. We may flirt with the big beers but the session beers are the ones we take home. Is Drinkability just another word for Compromise? Some might argue that this very quest for drinkability is what led us down the slippery slope to mass produced and mass marketed lagers in the first place. I mean wasn’t it the quest for a neutral beer people could purchase in large quantities that resulted in beer stores where 24’s of Molson Canadian and Bud Light rolled out on conveyor belts and into the back of your pickup truck? Initially the reassertion of craft beer could be seen as the antithesis to everything lacking in ‘big box’ beer including flavour and alcohol content. We got hop bombs and barley wines, barrel aging and double bocks but did we fill the niche for a go-to beer that can please almost everyone? I do not think this is a hypocritical goal for craft brewers as drinkability (though once distorted to ugly levels) is an essential and, let’s face it, basic element. Perhaps most importantly drinkability is an element that has a direct impact on customer loyalty and patronage. Last time I was down in Mount Hood, OR I paid a visit to Full Sail brewery and picked up a mixed case of the three session lagers they are producing; the Fest, the Black and the Premium. Each of these lagers, housed in cute little stubby bottle, manages to find that balance between flavour, body and, wait for it, drinkability. Not too strong, not too hoppy and not too heavy this trio has found their way into my heart (and into my regular beer rotation). 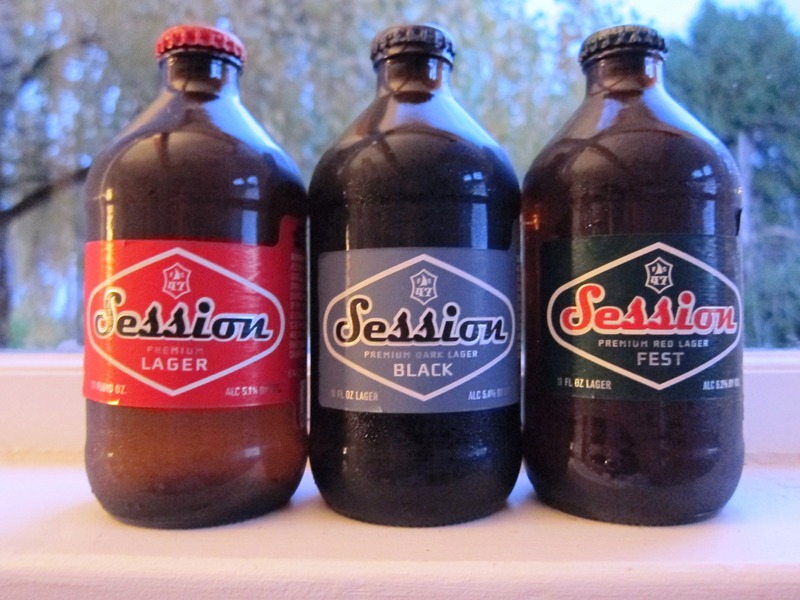 If you haven’t found a place for session beer in your life you really need to give these little guys a try. 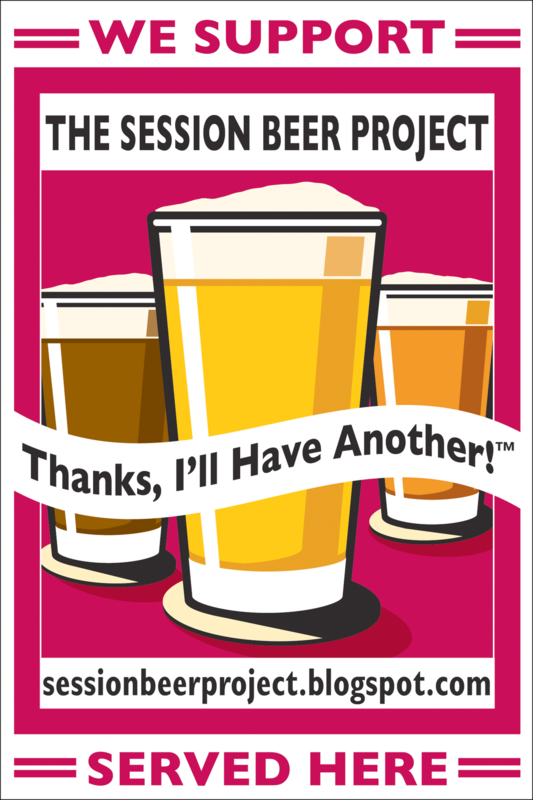 For more information on the session beer movement, check out the Seen Through a Glass blog for information on the The Session Beer Project and Session Beer Day (April 7th). Recently I had the chance to sample several Italian craft beers, courtesy of my more worldly beer geek friends, and it was an interesting opportunity to see the direction craft beer is taking outside of the more familiar beer loving countries. Craft beer seems to be fostering a niche for itself in new locations by fitting into the existing culture in quirky and unexpected ways. For instance, the Italian craft brews we sampled were purchased at a beer and book store (this may be as close to heaven on earth as it gets for me). While the store may not be able to boast about volume there was definitely enough variety to give pause to even the most ardent wine lover. Also, targeting book nerds in an effort to re-direct a bit of that nerdiness towards craft beer …brilliant. As I have long maintained, at their hearts beer geeks are, well, geeks; they appreciate quality over quantity, quirky over conventional, personal over generic and in this sense tapping into a previously untapped craft beer market may not be that complicated after all. Really, I could not say it any better myself. Birra Amacord Tosca Chiara Doppio Malto [Lager] – Gold in colour, cloudy with a small amount of white head. 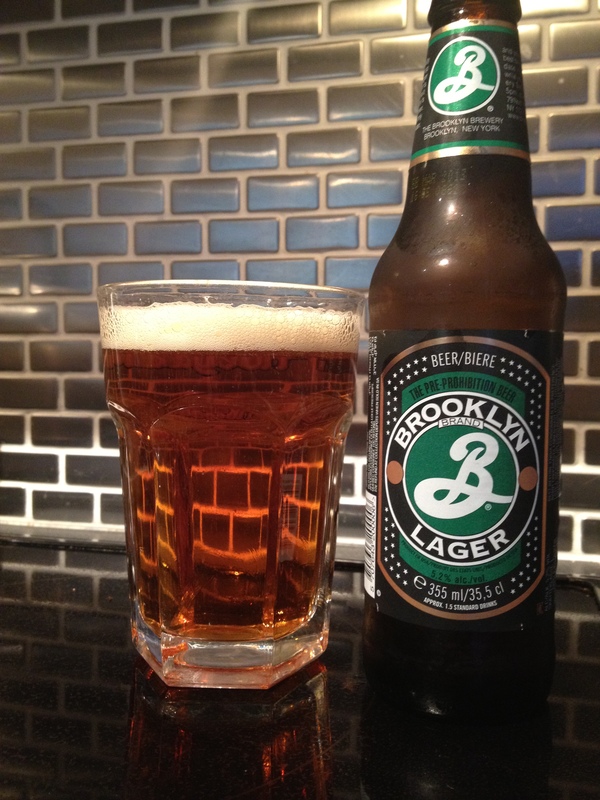 Heavy on the malt and hop flavours compared to a North American Lager. 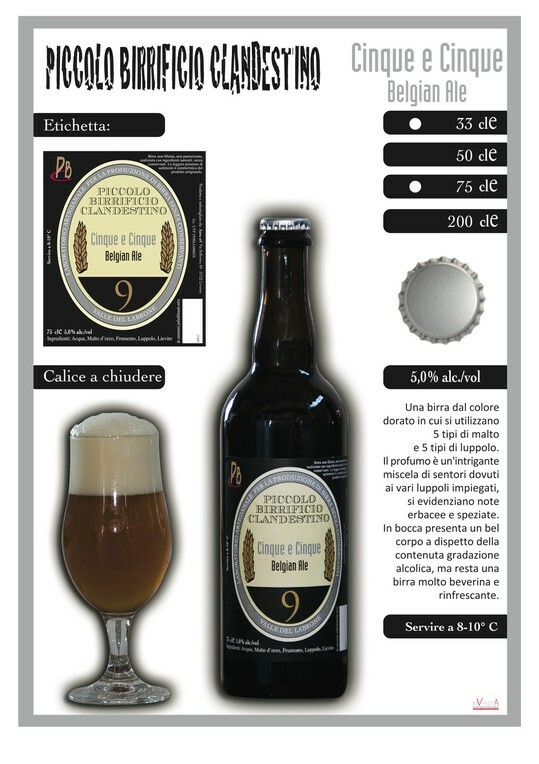 Piccolo birrificio clandestino Cinque E Cinque [Blonde] – Deep gold in colour and cloudy with white head. Sweet malt flavour and very smooth to drink. 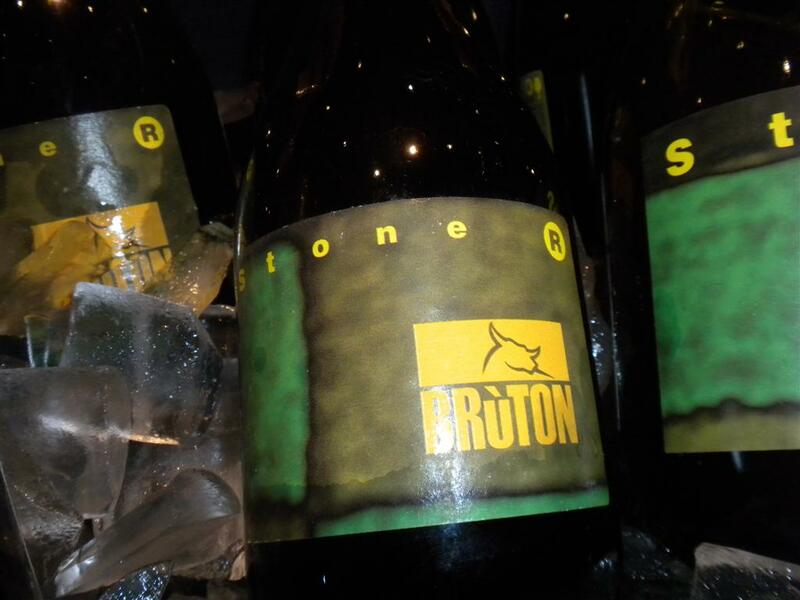 Birrificio Bruton Stone [Blonde] – Gold and cloudy with white head. A very sweet and malty blonde. A blonde with a bit of a kick. Piccolo birrificio clandestino Santa Giulia [American Brown Ale] – Brown and sediment heavy with caramel notes on the nose. Well-balanced with sweet malts and a bitter hoppy finish. Medium to full bodied beer. Birrificio Bruton Lilith [Red Ale] – Red colour with lots of head. Hop heavy on the nose and fairly light bodied. Birrificio Math LA 16 – Lots of caramel nose, very cloudy, amber colour and quite a decent amount of hop. Overall Italian brewers seems to be embracing Belgian-inspired, cloudy, malt-forward beers with hops introduced to bitter the finish. The Italian beer we sampled played it safe flavour-wise (no watermelon anchovy beers here) and appeared to prioritize high-quality ingredients and subtle character. Craft beer is definitely making inroads into new areas and expanding the beer geek legion in the process but I do not think wine has any need to be afraid of being replaced as Italians’ drink of choice …not yet anyway (mwah ha ha). Can You Taste the Freshness? As all good beer geeks know some beers can be aged to bring out the flavours while other beers are meant to be drunk right away. Generally light beers like lagers, fruity beers and hop heavy beers like IPA’s need to be consumed as close to the bottling date as possible to preserve the best possible taste. But can you really tell the difference? How long is too long to leave your favourite light summer beer? 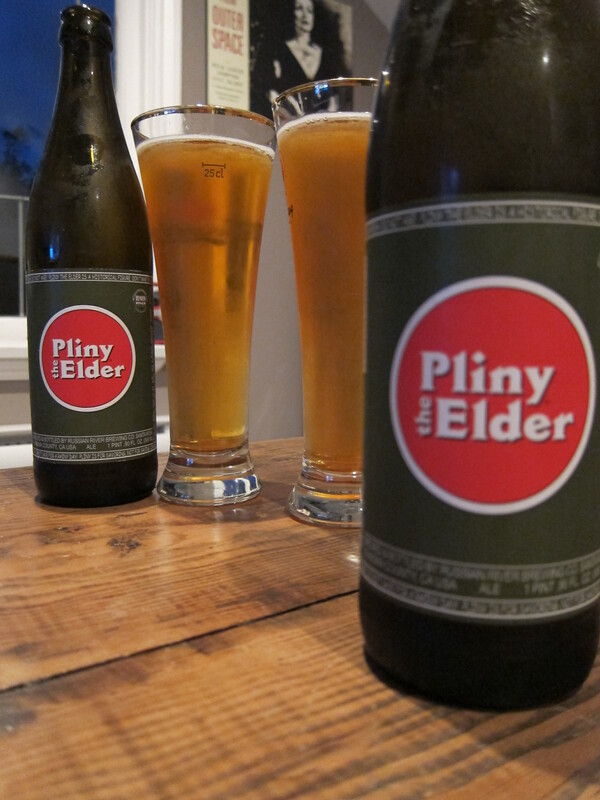 In order to put the ‘fresh is best’ affirmation to the test I did a blind tasting with two bottles of Russian River’s Pliny the Elder, one bottled in May and one bottled in July. Pliny the Elder (May) – Bright gold, effervescent with a minimal amount of white head. Lots of piney hop notes on the nose, resiny flavours and a bitter finish. Light-bodied and smooth. Pliny the Elder (June) – Bright gold, effervescent with white head. Lots of piney hop on the nose, resiny and strong bitter finish. Light-bodied with a dry finish. In terms of appearance these beers were almost identical with the fresher Pliny having slightly more head that seemed to stick around a bit longer. The hops on the nose were too close to tell for me but my beer drinking partner thought the July Pliny had more hop character on the nose. 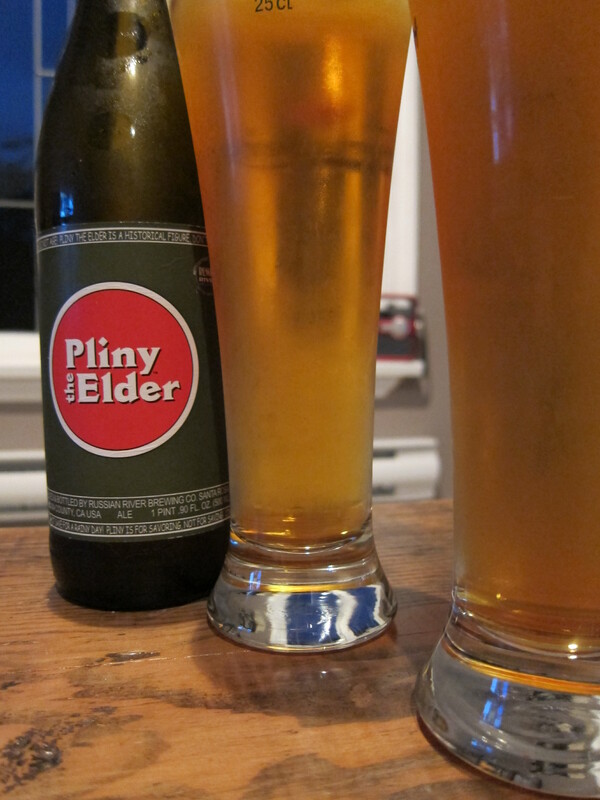 The older Pliny seemed less bitter and a bit smoother overall. Two months are not a huge amount of time but the taste differences are discernible if subtle. Handed either of these Pliny’s on their own, I would say they were both very drinkable and I had no sense that one had been sitting on the shelf for a longer period. But I definitely think finding the freshest beer you can only enhance the experience and give the drinker the truest sense of what the brewer intended. Check your labels people, ensure your beer has not been taking up real estate at the local liqour store, and if the bottle is dusty think twice! Does Beer Geek ≠ Foodie? I always assumed that craft beer was a natural extension of foodie culture. 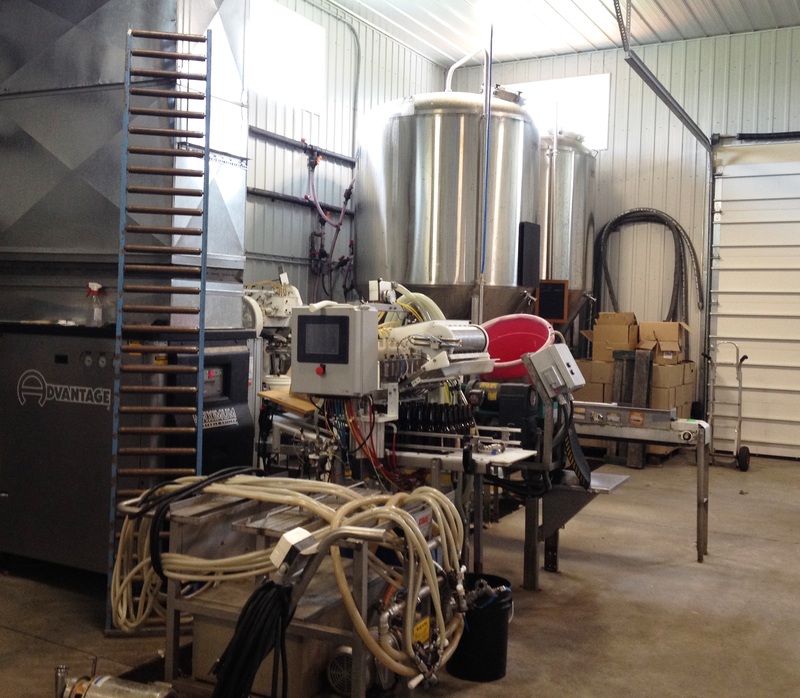 Love of quality ingredients, focus on the art of preparation, the desire to know where you food comes from and who makes it, all seem like tenets that marry well with beer geek culture BUT lately a number of brewpubs seem to have set out to disprove my theory. I know that beer and pub grub (think nachos, deep fried whatever, shepherd’s pie) have a long and well-established relationship and you go to a pub for the beer not the gourmet cuisine blah, blah, blah but craft beer is an entirely different animal right? The pride and quality that goes into producing small batches of unique beer should not be hindered by pairing said beer with mediocre food offerings more suited to a case of the late-night munchies at the 7-11. I am not saying I need complicated or elaborate courses served at the breweries but I do want the quality of food to be a reflection of the quality of the beer. I want food that compliments and enhances the character of the beers, and I have to believe I cannot be the only one. 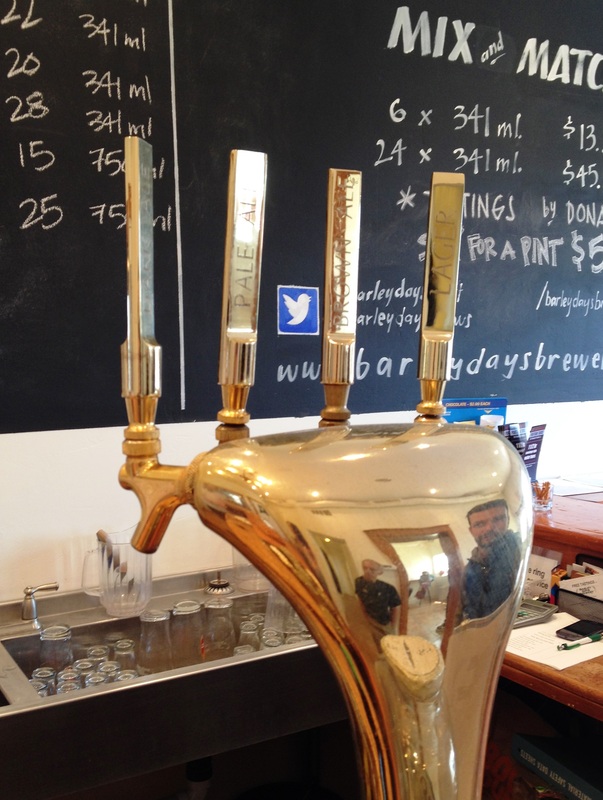 Luckily here in Vancouver we have many awesome tasting rooms like Alibi Room and Bitter Tasting Room that provide finely honed menus to suit their craft beer offerings. In Beervana aka Portland I have also had the pleasure of visiting brewpubs with stellar food selection like Cascade Brewing Barrel House and Hopworks Urban Brewery. These places manage to put a foodie twist on pub staples, toss in some unexpected items, have menu diversity and just generally keep the quality of ingredients very high. Sadly this has not always been the case with other brewpubs. On Thursday I visited Chuckanut Brewery and Kitchen in Bellingham Washington. 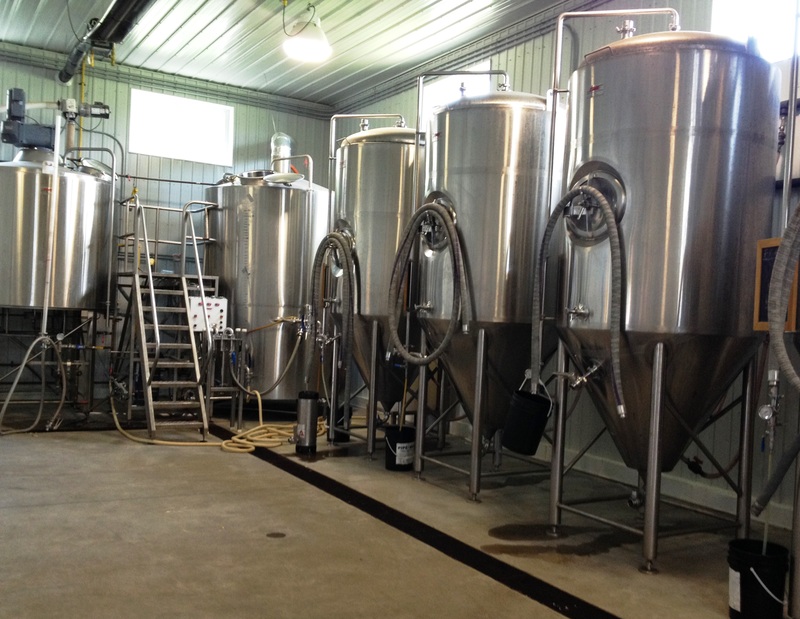 The brewery and tasting areas are housed in a typical warehouse-like buildings situated beside a small river in the heart of downtown. Displayed along the entrance way are the numerous awards bestowed upon Chuckanut craft brews; I was particularly excited to try their much lauded Kolsch. There is a small seating area by the bar, a large seating area in front of an open kitchen, and a patio with a few tables along the water. I also noticed a back patio, which I assume plays host to events or tastings at the brewery. It is a pretty nice layout all-in-all with lots of flowers lining the fence along the patio. When we got the menus I was happy to see that all the food is prepared fresh as you order. Not a lot in the way of veg friendly options and a pretty standard line-up of brewpub fare like Bangers and Mash, BLT’s and Burgers. Faced with two choices, hummus or yam fries, we opted to split an order of fries to accompany our sampler of the six beers. Our food came quickly, so quickly in fact that I saw the fries sitting on the counter about two minutes after my partner order (warning bells alert me that fresh made in two minutes violates the laws of physics). Needless to say the food was pretty bad, well really bad actually, kind of like eating day old fries that attempt to make up for their questionable freshness with tons of salt. The food went back and we opted to focus on the beer sans nourishment – our waitress was not too happy and pretty much ignored us for the remainder of our visit so we probably could not have tried something else from the menu anyway. But this is a beer blog so I will get on with the beer assessment. I inadvertently learned the Kolsch was a no-show when I found a British IPA in its place –bummer. The other five beers we sampled were the Pilsner, Yellow Card Ale, Rauch Lager, Golden Ale and the Smoke Porter. The Pils was very pale gold and effervescent. It was very dry, light in body with a bitter hoppy finish; would have benefited from a slightly colder serving temperature. The Yellow Card and the Golden were somewhat similar in appearance with the Yellow Card Ale being stronger and hoppier with some fruity element on the nose. The Golden Ale was milder with a nutty flavour. The British IPA was orange-gold in colour with lots of stiff bright white head. It was very smooth but quite dry again with a subtle hop character. The Rauchbier and the Smoke Porter both had a lot of hickory (sweet but smoky) flavour almost like applewood smoking. In the Rauch this smoked flavour dominates the palate while in the porter it adds another dimension to a fuller bodied beer. I wish the porter had more of a rosted quality to it. I think both of these beers would be fun for food pairings since they have a lot of character. If I visit again I would get the British IPA and try the Kolsch. So you can take what you will from this rant; either it is about the beer and food is just a side-note or craft beer and foodie culture really make great bedfellows. I think as the craft beer market continues to define its place in the world, the food breweries choose to serve alongside their beers must not be an afterthought but rather a compliment to and a reflection on the care and passion put into each and every beer being served.